Small Log Cabin Plans . . . 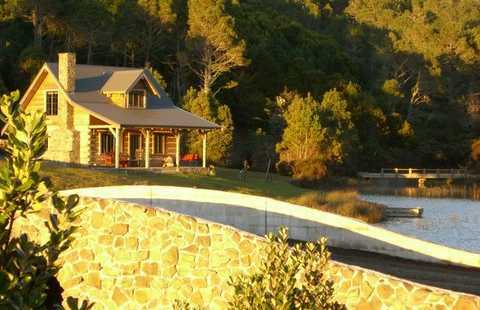 Refreshing Rustic Retreats! 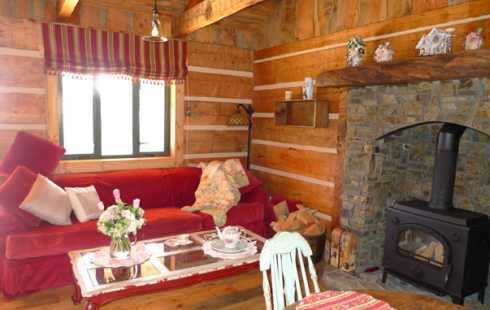 The small log cabin plans featured here are ideal for vacation getaways and retreats. 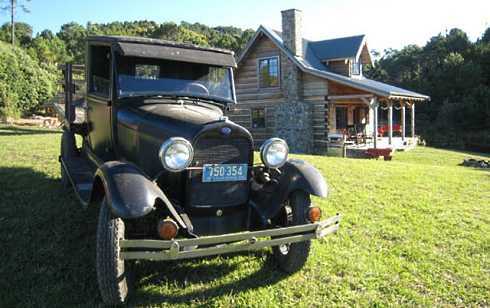 Ranging from a compact 432 square feet to just over 1,100 square feet in area, they combine "old time" styling with modern-day efficiency and convenience. 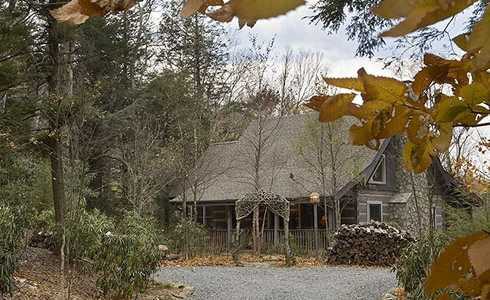 Available from Appalachian Log Homes, each of the plans is designed for year-round livability. The one story Yukon Trail II, pictured above, encompasses 432 square feet of living area. 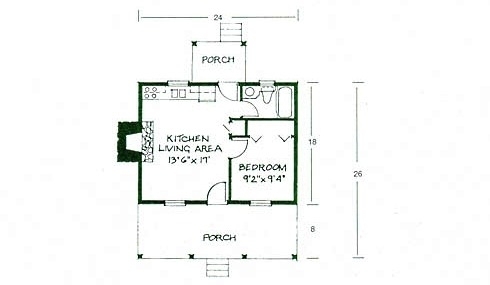 As shown in the small log cabin plan that follows, this compact design has one bedroom, one bath, and a great room comprised of an open kitchen and living area. 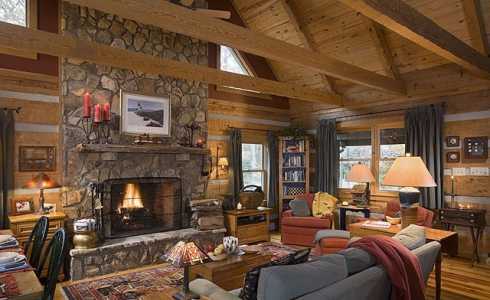 An arched stone fireplace surround houses a wood stove that is vented through a large stone chimney. The rustic wooden mantel shelf provides an ideal place to display collectibles and family mementos. 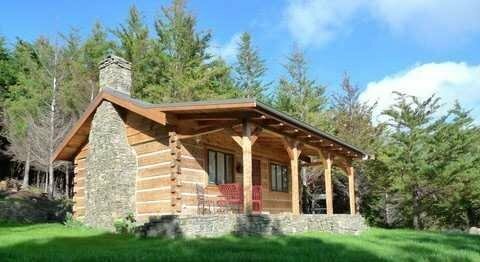 The Silver Mountain from Appalachian Log Homes is a classic small log cabin design. 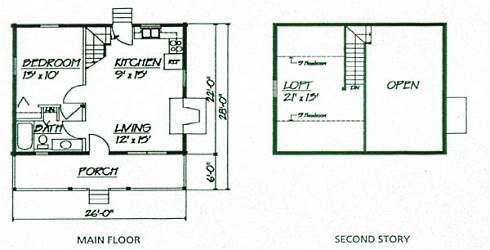 At one and a half stories, it encompasses a total of 707 square feet. An upper level loft overlooks the open kitchen and living area below, which features a soaring cathedral ceiling to make it feel larger than it actually is. Included on the main level is a bedroom and full bath. The rustic fireplace design pictured at right is crafted from stones of varying sizes and predominately rectangular shapes. A raised hearth elevates the wide firebox opening with an arched top to make it more visible from anywhere in the room. A simple sawn timber mantel shelf caps it off and provides a perfect place to display treasured family photos. Somewhat larger in size is Appalachian Log Homes' Lonesome Pine II model. 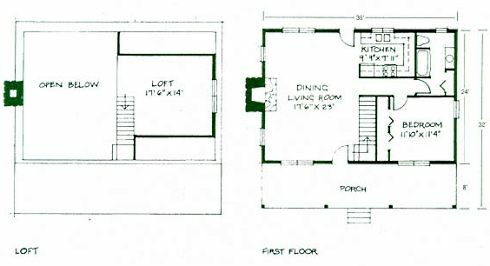 Another one and a half story design, it boasts a living area of 1,148 square feet. Once again, it features an open floor plan with a soaring cathedral ceiling and upper level loft. 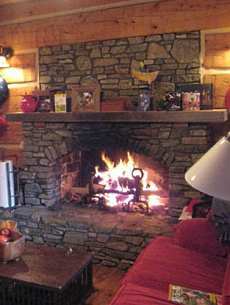 The cabin's warm and inviting floor-to-ceiling fireplace is crafted from fieldstones of varying sizes and shapes, assembled in a random mosaic pattern. A raised hearth elevates the rectangular firebox opening to make it easier to see from any point in the room. 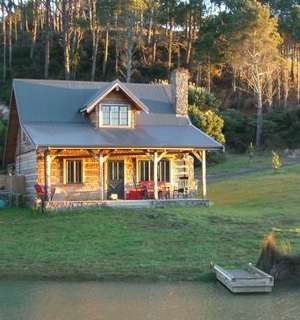 Please check back often or subscribe to our RSS feed, as we frequently add small log cabins to our site.